Here is my review of Alan Westin’s book Privacy and Freedom. I would welcome your views on the review. I would be particularly interested in what you think of the following thesis. The privacy professionals have failed to deliver on the promise of privacy as corporations show a disregard for privacy. The work of Westin and others, while well intentions, has failed to deter the demand for personal data as a commodity and shows the weakness of the privacy compliance work. The book remains important which is why I think the questions need to be explored. 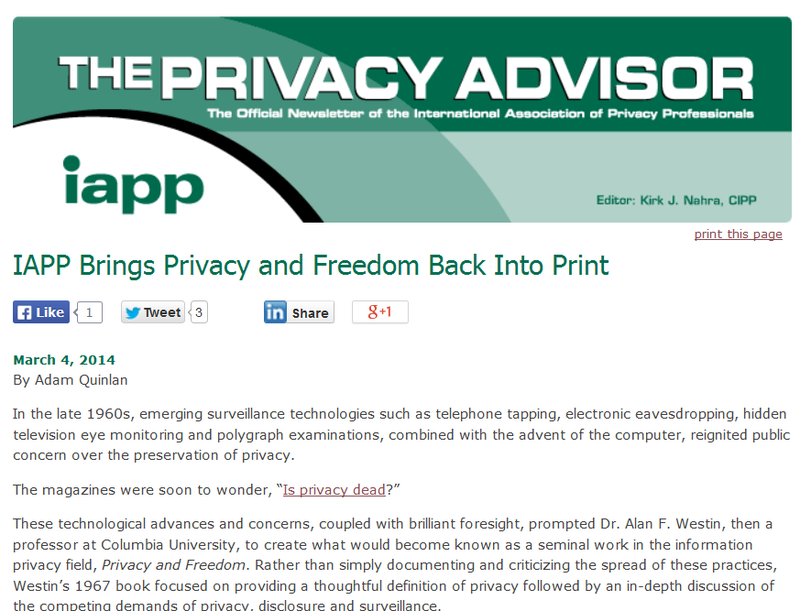 The IAPP has republished Alan Westin’s best-known book, Privacy and Freedom, which was first published in 1967. Despite its age, the new version, it is the same text with several introductory essays, provides context for a reader coming to it for the first time. The introductory essays, which include one by Westin on how he viewed his work and its impact, provide a useful context for the author, the book and its relevance. Although the introductory essays offer an insight into the book’s impact and the author’s contribution to privacy professional field, a critical essay would have been welcome because the privacy landscape has changed dramatically. The change is more than technological because it includes the change in cultural attitudes to privacy. The cultural and technological changes have undermined his definition.